Find out what happens at your planning appointment before external radiotherapy for breast cancer. The radiotherapy team plans your external beam radiotherapy before you start treatment. This means working out the dose of radiotherapy you need and exactly where you need it. Your planning appointment takes from 15 minutes to 2 hours. You usually have a planning CT scan in the radiotherapy department. The scan shows the cancer and the area around it. You might have other types of scans or x-rays to help your treatment team plan your radiotherapy. The plan they create is just for you. The radiographers help you to get into the right position. You lie on the CT scan couch on a special board called a breast board. You might also need to raise both arms above your head. The radiographers tell you what is going to happen. They help you into position on the scan couch. You might have a type of firm cushion called a vacbag to help you keep still. 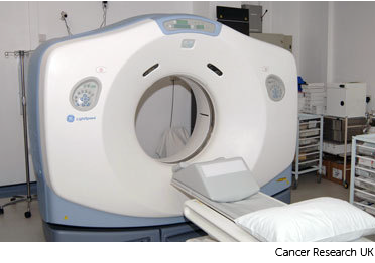 The CT scanner couch is the same type of bed that you lie on for your treatment sessions. You need to lie very still. Tell the radiographers if you aren't comfortable. You might need an injection of contrast into a vein in your hand. This is a dye that helps body tissues show up more clearly on the scan. Before you have the contrast, the radiographer asks you about any medical conditions or allergies. Some people are allergic to the contrast. Once you are in position the radiographers put some markers on your skin. They move the couch up and through the scanner. They then leave the room and the scan starts. The scan takes about 5 minutes. You won't feel anything. The radiographers can see you from the CT control area where they operate the scanner. Your treatment team puts all the scans together in a special computer to decide your radiotherapy plan. The radiographers make pin point sized tattoo marks on your skin. They use these marks to line you up into the same position every day. 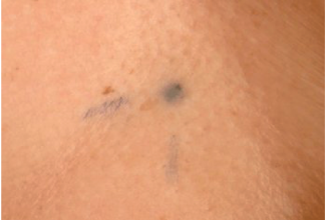 The tattoos make sure they treat exactly the same area for all of your treatments. They may also draw marks around the tattoos with a permanent ink pen, so that they are clear to see when the lights are low. The radiotherapy staff tell you how to look after the markings. The pen marks might start to rub off in time, but the tattoos won’t. Tell your radiographer if that happens. Don't try to redraw them yourself. Your treatment team might make a mould for you. They call this a shell. You wear the shell during the treatment sessions to keep your breasts in the same position each time. The radiographers might also make marks on it. They use the marks to line up the radiotherapy machine for each treatment. The process of making a shell can vary slightly between hospitals. It usually takes around 30 minutes. You need to wear clothes that you can easily take off. You also need to take off any jewellery from that area. A technician uses a special kind of plastic that they heat in warm water. This makes it soft and pliable. They put the plastic onto your chest so that it moulds exactly. It feels a little like a warm flannel. After a few minutes the mesh gets hard. The technician takes the shell off and it is ready to use. You might have to wait a few days or up to 2 weeks before you start treatment. During this time the physicists and your radiotherapy doctor decide the final details of your plan. Then the physicists and staff called dosimetrists plan the treatment very precisely using computers.